Take a step back in time with me. First century, Judea. Jesus tells his disciples to take up the cross and follow him. This was hardly a comfortable or even acceptable thought. The reality of the Cross was that it was used to make a statement to the people. Rebel against Rome or doing something criminal and this too can be your fate. No one wanted to end up on the Cross, let alone pick it up. Granted Jesus is talking metaphorically for his disciples, but, he knew that this would be his fate because of the radical nature of his message. He was proclaiming a Kingdom that would replace Rome and would be eternal, not like the temporary nature of manmade structures, whether civil or religious. The commitment to follow him included the Cross and it would be the deciding point for many. The need for us to accept suffering in our lives. This is my fear for each of you and every Catholic including myself. That given all the news that keeps coming out, our hearts will fill with despair and this will choke ou t our faith and our commitment to Jesus. With Christ, no matter what people have done in the Church, we, the living Church, will always have hope. We pray after the Lord’s Prayer every Mass: “we may be always free from sin and safe from all distress, as we await the blessed hope and the coming of our Savior, Jesus Christ.” We are pilgrims in this world walking with our eyes fixed on Jesus, even when it is tough, and the way seems hard. Rolheiser concludes his article with this statement: that we can only take up our Cross when we begin to believe in the Resurrection. What a great statement for us to consider, considering the turmoil of the Church right now. Our faith is in Jesus who calls us to take up the Cross knowing what the disciples did not know; that Easter morning would be end of the story (or its beginning), not Calvary. Jesus reminds us of the hard truth of discipleship: when we give our lives over to him we must walk with him to Calvary, but also to Easter Morning. 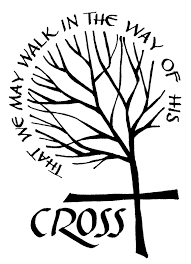 May each of us take our Cross and walk with Jesus, not just to Calvary, but beyond to the Empty Tomb and life eternal.